This entry was posted on Wednesday, October 12th, 2011 at 12:00 am and is filed under Comics. You can follow any responses to this entry through the RSS 2.0 feed. Both comments and pings are currently closed. I haven’t played star trek online yet. How bad is this Q really. Shame on you. Haha, he isn’t in the game to my knowledge, these are next gen jokes. 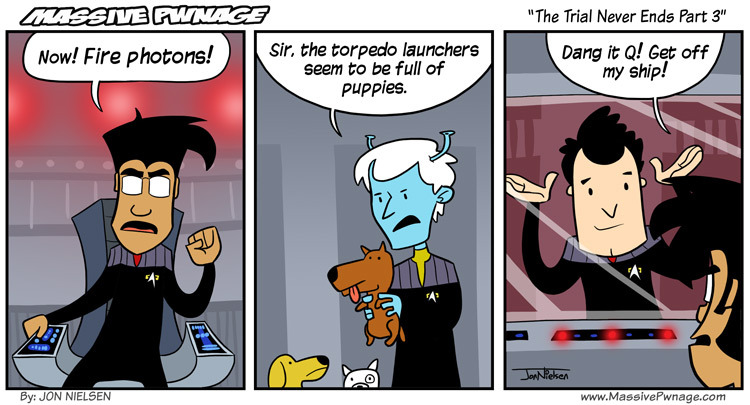 puppies in the torpedo cannons? i accept your challenge! FIRE THE QTON LAZERS! TURN THIER ENTIRE CREW INTO A BUNCH OF Qs! It didn’t have any ads at all back when I played, which was a few months ago. I don’t know what it’s like now or what it’ll be like when it finally goes free to play.